A carbon credit is, well, a piece of paper, certificate, e mail, something (hopefully recycled) that constitutes “credit” for reducing, emitting, producing or not producing a product or service, or just plain old breathing. They’re extremely popular among those with globs of money to feel better about themselves. Call them a ‘get out of jail free’ card for self-righteous hypocrites. They are redeemable, tradable, upgradeable, sellable, give-awayable; sort of like airline miles, but not as useful. 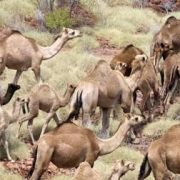 The Aussi G men believe they can hit the camels and exchange the cut in methane, sans dead camels, for carbon credits for farmers. Why are Australian farmers forced to buy “credits” anyway? In typical environmentalists’ math, they estimate each shot camel will produce an “emissions avoidance benefit” of 15 tons. Pretty good deal, except if you’re a camel. I wonder what their “avoidance benefit” is? In the schizophrenia of the neo-religion of Green, such schemes are never enough. Recently, an OEM rented out a city park for demos of their already low emission products. Powersports dealers could test the products they would offer consumers. The responsible company promised to fix the park back better than it was; they planted trees elsewhere to make up for their impact, and encouraged dealers to do likewise. They conducted the strictest recycling practices I’d ever witnessed. In all, this successful company bent over double dog backwards doing the right thing as members of their community. They far outdid any of the efforts you’d see at an “Earth Day” down on the Washington Mall, that’s for sure. Citizens who use the park daily were impressed with many asking for nothing else but how could they get in on the demos. Alas, it wasn’t enough for some true believers in the local media who bemoaned the event somehow, someway, Mars lined up with Jupiter or something destroyed the planet. Shoot the Camel. According to a study conducted by Harvard and Boston U, and a university in Finland, heavy pollution from Asia is the actual reason for no rise in world temperature over the past decade. I know; that doozey left us scratching our heads. On the converse, England’s environment secretary warned that “climate change” will disrupt all important wi-fi connections. Sadly, she didn’t comment on the carbon footprint of the recent rioting across the country. Shoot the camel. In some good news, a Duke University study discovered the world has 657 more islands than previously thought. Who says they ain’t making anymore land? At the risk of sounding like a broken record, personal watercraft owners, the folks who make them and the fantastic people who sell and service these amazing products are closely in tune with the environment. We’re literally in it all the time, rather than sitting around in some university offi ce coming up with contradictory “studies” and predictions of the sky is falling to appease the people who hand out grant money. Our community is made of business people, small business owners and individuals with a passion for the water and being on it. We are inclusive and open. The envrio’s answer to everything is to control it or ban it: Shoot the camel. Our view is to let people enjoy their public waters in a safe and sound manner along with all other citizens. Equality and freedom are at stake, and the price couldn’t be any higher. Once a freedom is lost, it’s not coming back. Get involved. Think Free. Live Free. Ride Free.